Cupid will be stopping to deliver treats on Valentine’s Day. You can send one to your roommate, spouse, neighbor, pet or anyone who lives at Ultris Courthouse Square. Stop by the office, call or email us. Tell us who you would like to send your spe-cial Valentine to. Add a personal message or remain anon-ymous. On Valentine’s Day we will deliver your valentine outside the door. Last Day to take orders is Tuesday, February 12th. 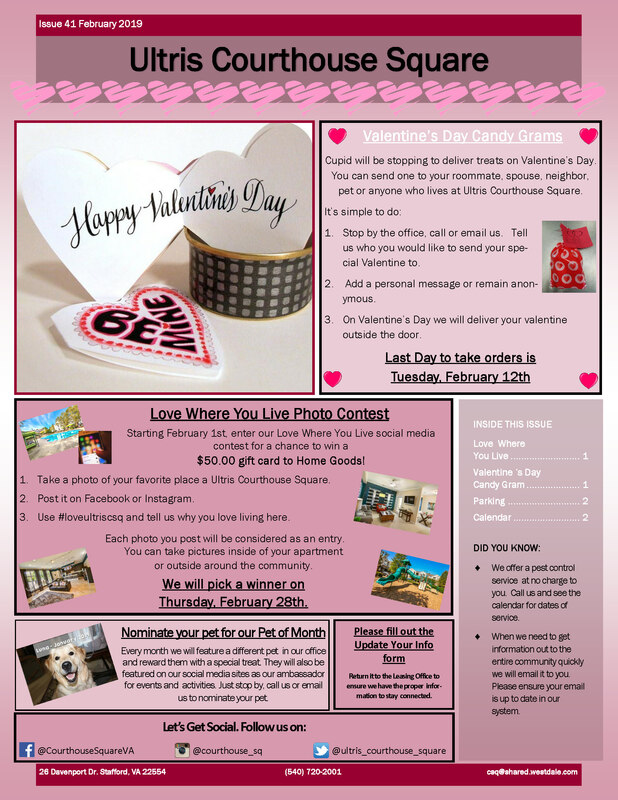 Starting February 1st, enter our Love Where You Live social media contest for a chance to win a $50.00 gift card to Home Goods! Take a photo of your favorite place a Ultris Courthouse Square. Post it on Facebook or Instagram. Use #loveultriscsq and tell us why you love living here. Each photo you post will be considered as an entry. You can take pictures inside of your apartment or outside around the community. We will pick a winner on Thursday, February 28th. Every month we will feature a different pet in our office and reward them with a special treat. They will also be featured on our social media sites as our ambassador for events and activities. Just stop by, call us or email us to nominate your pet. 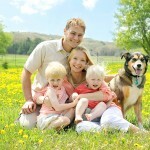 We offer a pest control service at no charge to you. 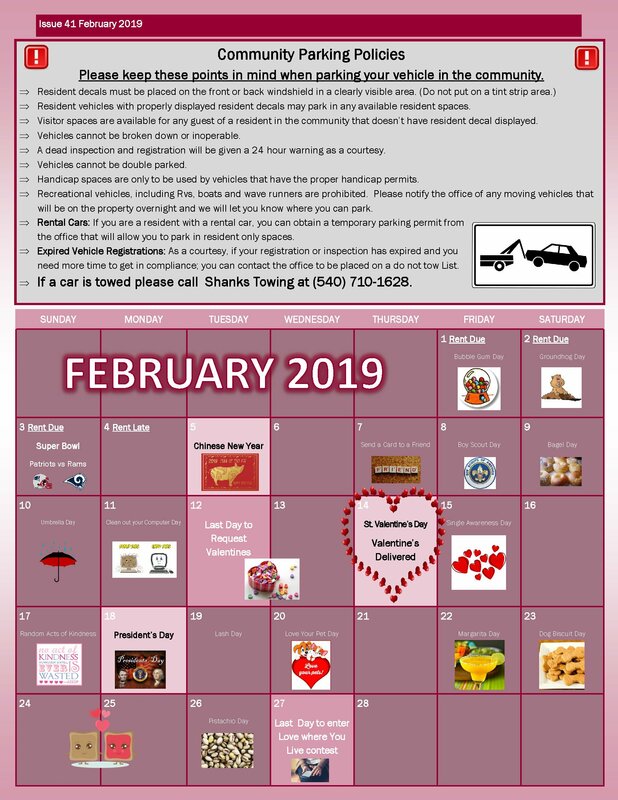 Call us and see the calendar for dates of service. When we need to get information out to the entire community quickly we will email it to you. Please ensure your email is up to date in our system. Please keep these points in mind when parking your vehicle in the community. Resident vehicles with properly displayed resident decals may park in any available resident spaces. Visitor spaces are available for any guest of a resident in the community that doesn’t have resident decal displayed. Vehicles cannot be broken down or inoperable. A dead inspection and registration will be given a 24 hour warning as a courtesy. Vehicles cannot be double parked. Handicap spaces are only to be used by vehicles that have the proper handicap permits. Recreational vehicles, including Rvs, boats and wave runners are prohibited. Please notify the office of any moving vehicles that will be on the property overnight and we will let you know where you can park. Rental Cars: If you are a resident with a rental car, you can obtain a temporary parking permit from the office that will allow you to park in resident only spaces. Expired Vehicle Registrations: As a courtesy, if your registration or inspection has expired and you need more time to get in compliance; you can contact the office to be placed on a do not tow List. If a car is towed please call Shanks Towing at (540) 710-1628.